I will be a part of 9th NIAIOUG Tech meet at Jaipur Rajasthan India. 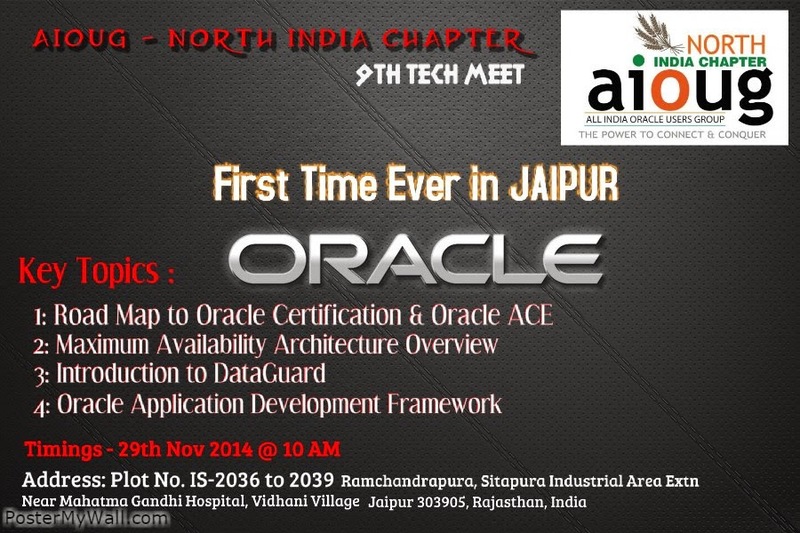 This is for the first time NIAIOUG is organizing Oracle User Group Tech Meet in Rajasthan. I am very please to be part of this meet and look forward to a great audience at JECRC University Jaipur. Hope to see some awesome IT Professionals and Students in my session. Aman, Nikhil and Navneet will be speaking on Database topics. This all will be very useful for DBA's as well as aspiring DBA's. I will be speaking on ADF and Jdeveloper 12c. There will be a small demo at the end and then there will be open question answers session where anyone can ask questions as how to learn , move into Oracle ADF. Hope to have a good time @ JECRC Jaipur.